Kinda cool, huh?? I am so stinkin proud of myself for figuring this out!! The space was already there and it is perfect...they are still almost in reach and better yet...in VIEW!! Thanks Patter for leading me to that blog!! BUT, on to the page for the day!! This page came together pretty quick. I was looking at piles of pattern paper that I had sorted out from kits...wanting to just USE them and not re-file them to be lost again forever. so I decided to make a pile that I would MAKE myself use this month!! <<I'll let you know how that goes, bwaaahaha>>. The paper for this one is a couple of fun sheets from Scenic Route that Ive had around forever. Thats it for today! I have some more H&M for you tomorrow and my Scrappy sketch will be back on Sunday! 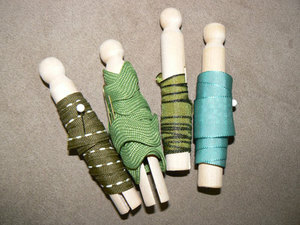 I have a new scrapper designing with us...can you guess who she is? I'll let you know in 2 more days! 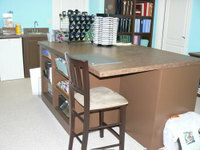 Here are a few of the photos of the scrapbook room that I promised you. Some may be just like the ones I posted almost a year ago, but my reading audience has changed and grown since then, and parts of the space have changed. I'll do a series of photos over a few days for you all. Today, I will start with my island. My biggest struggle since I went to the island has been to be able to access all the stuff that I use every day, keeping it organized, within reach, and off my work area. Thats hard to do with out things hanging on walls and off of shelves. 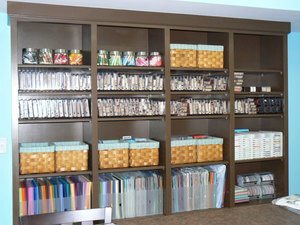 But I also don't want to clutter the streamlined look of my shelving on the walls either. So, my biggest gripe has been my punches...over 30 of the whale tale style...yikes...do I have an addiction problem or what? I have tried about 3 different storage ideas since last May...urgh! I think I fianlly got it to work. First up is the top of the island...and NO its not always this clean! I have lots of room to work, shove stuff to the side, and even share the space with a friend. I ended up with a nesting of 3 cubbies on top and my SU! stamp pad carousel. Besides the 48 colors, 6 in colors, and all the basic neutrals I also keep last years in color on top. (The top of the island itself is about 4x5' I think?) On the first cubby that faces me are the things that I use the most. starting from the top: in the pencil cups I keep my scissors, exacto, coluzzle blade,pens,brushes,handheld punches,bone folder,etc. I also have the button collection. This was very hard for me to throw them all (well, not all...the SU! 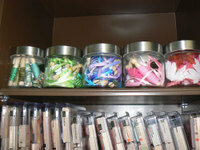 and Doodlebug are still separate) in one container. I liked the color combos in the bags they were in, but ever since I saw Amy's huge jar, I though maybe I'd use them more if they were right here, instead of behind me. Inside the first cubby set I have all of my markers, which is a fav right now. I ahve all the SU! colors along with blenders, journalers, and retired colors in an expanded box..(Its actually the inside of the marker case that has been rubber-banded to another half of my old marker case). 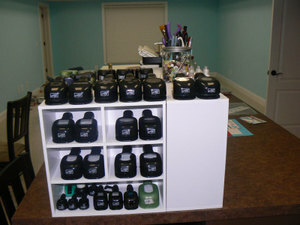 There are also my copic markers (and room for new ones), glitter pens, glaze pens, gel pens, etc. 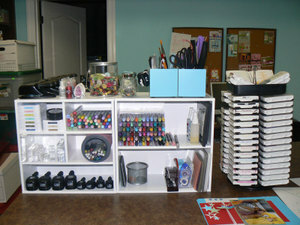 Other items: acrylic blocks, stickles, cleaning pad, adhesive caddy, cuttlebug plates, CTMH and Palette pads, and my small SU! punches. Most of my larger SU! punches are in or on the next cubby to the left. The last cubby is behind this one and holds the rest of the SU! punches (mainly retired ones) as well as other brands. The cuttlebug itself is here, and I may set up the sewing machine there too? Also, you may notice a small blue basket...that is where I throw my itty bitty scraps of pattern paper scraps and small ribbon scraps. 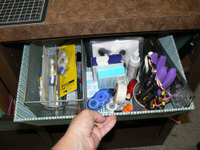 Here is a link to Nancy Riley's Blog, iStamp. 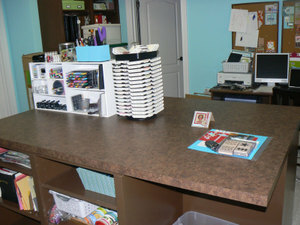 She has a fabulous pegboard system behind her stamping desk. All of her punches are hooked on a curtain rod for easy access...very cool. 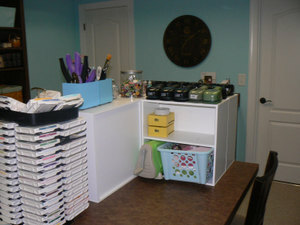 This is the bane of my stamp room right now, I don't know how to store my punches on my island!! 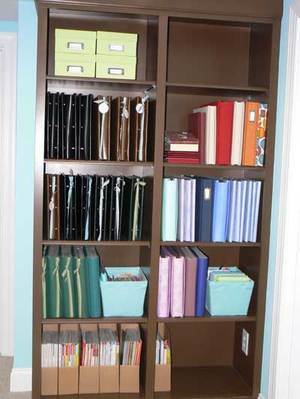 ANyway, she has a few neat tips for those like me always looking to improve upon organization, or lack-there-of! Here's a couple more shots of my space. 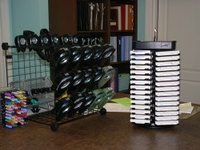 I broke down and ordered the ink pad caddy from Stampin' Up! (actually I got it FREE with my points). It works great if you have a big desktop space, which I now do!! My punches I have struggled with for a while. 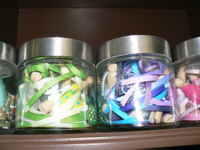 I couldn't figure out a way to get them on the shelves like I like them, and I wanted quick access to them...so, voila! I took one of the wire cube outlines from my old cardstock storage system. And the punches fit perfectly on the end. I had to add some stuff inside and on the cube to weigh it down though, those punches are so darn heavy!! And then there's the marker issue. What to do when you have duplicates, neutrals, old colors, journalers? 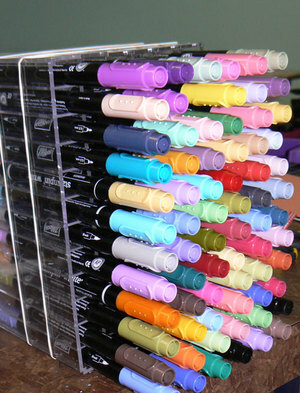 I took apart my marker cases (one old, one newer) and added 2 rows from one onto the end of the other. Then they are rubberbanded together to stay put..not as nice looking as the whole case with the cover and all, but hey, it works! We are in the new house finally! Well, actually we've been moved in a few weeks now. I felt obligated to unpack the rest of the house before I started to organize my space. I have actually done a couple of clubs and a couple of shows since the move, but I still haven't been able to simply sit in my new space and stamp just for me! I'm uploading a couple of pics of the room as a teaser, and I'll have to take some more before I can upload them. I have a HUGE room. One end is open for nothing but tables for classes. The other end is my office space. I have 8 feet of shelves on one wall (floor to ceiling) and 4 feet on another wall. 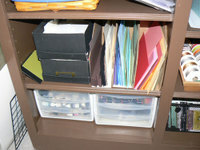 The smaller unit houses my completed scrapbooks and mini albums, magazines, old catalogs and idea books, and photo overflow. I still want to reorganize it a bit so it looks a little neater. The other wall holds almost everything else, LOL. Actually its just my consumables now. I have changed it a bit since this pic, I'll send through the updated one later. 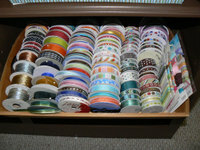 I'll also tell you then how its all sorted and stored.